Thurs. 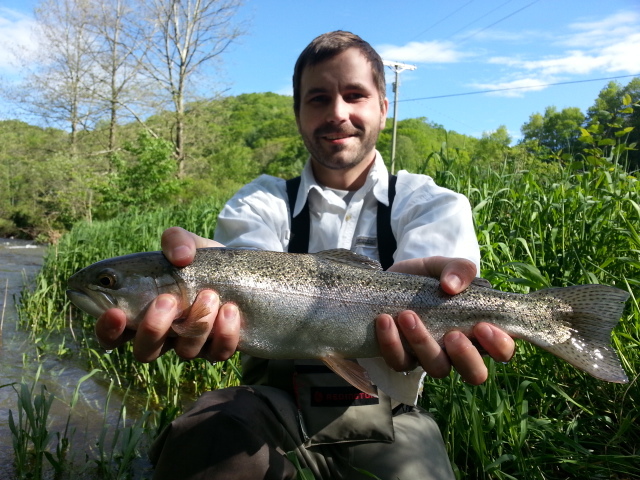 May 30, 2013…Good two days of fishing in East TN and Western NC. We did some small stream fishing and fished high water on the SoHo. We landed about 30 fish and then a dozen or so on the SoHo. 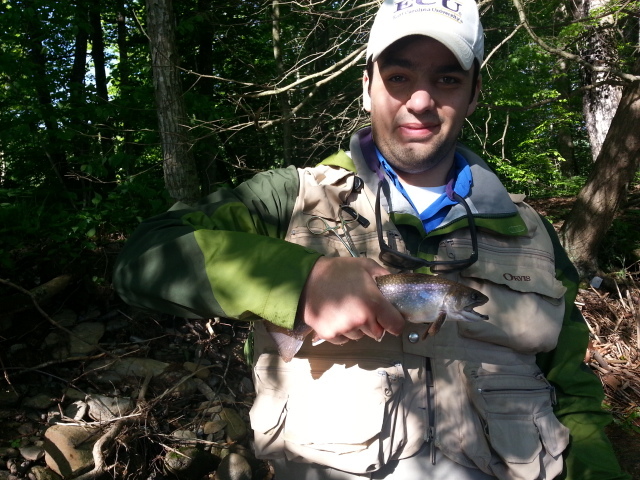 Thursday we did really well, we fished a small stream in NC and caught 35 fish a mix of rainbows, browns, and brookies. We had lunch and then headed over to the SoHo and had a good afternoon landing about 20 or so on dry flies fishing the sulphur hatch. The hatch on high water has been great and heavy albeit short in duration. Have a great evening….summer is here! Good Day of Fishing …. 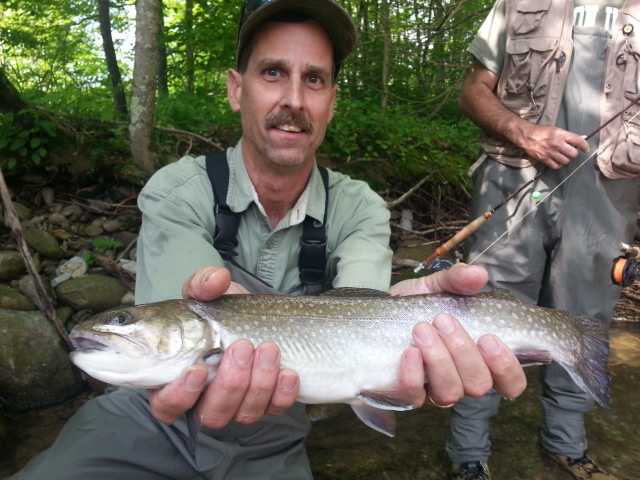 Tues. May 28, 2013….Good day so far guiding Joe Craig annual group trip. 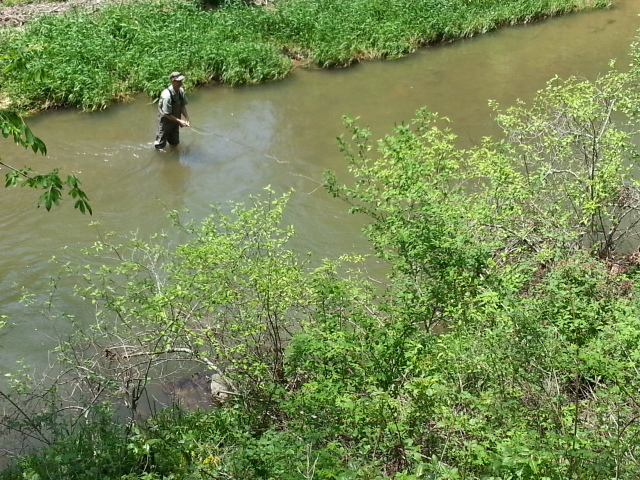 We had planned on fishing the SoHo and also the Watauga but they are releasing on both. 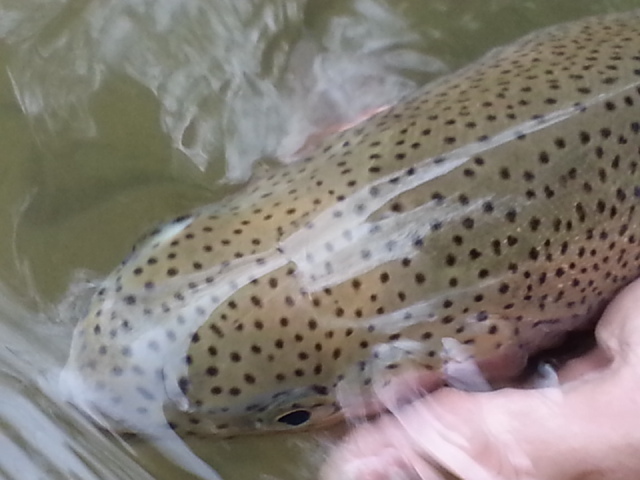 So we hit a stream in Cherokee National Forest and landed abiut 35 to 40 native rainbows and browns. Beautiful day and beautiful weather….taking a lunch break and then headed back for more…. Wet N Chilly Over for A While…. Guided Jerry Wells and Dan Campbell Group, Greensboro, NC, NC Mtns, after a chilly weekend things settling down a bit, very unseasonable in the mtns, some isolated valley frost. Water has been high in most places, maybe not in all but certainly most. Plenty of water. Posting these from a trip a few days ago that I had not yet posted we bounced around on several waters looking for fishable water. Did a trip with Jerry Wells and Dan Campbell, and their sons Kyle and Sam. We had a pretty good day, although slow to start after the major temperature swings and high water. Really high water. Probably the limit of what I would fish with clients. Would I still go? Yes. But hey, I am a different bird. We started slow, maybe 8 or 10 fish by lunchtime and then things were pretty good. I’d say we rounded out the day with about 35-40 fish, a good day anywhere and probably 6 of the fish caught were citation sized. We also had on several two footers or longer that were on for a bit , we neither saw nor turned, sans one rainbow Sam had one that was every bit 25 or 26″ long. Bummer. Got in some heavy water, made a run, broke off 3X. But it was a great day….and we finished up and it wound down around 5:00 or 5:30 mostly due to the cooler temps I am sure. Headed off for a 5 day trip to East TN will be guiding a group I do every May on the South Holston, plus we’ll be fishing some other waters too including a small private spring creek in S Central Va.. Will have on this trip Wendell Ott, Judge Joe Craig, UNC University System President Tom Ross, Ron Davis, Allen Peterson, Rusty Walker, Bill Leinster….should be a great trip if the TVA will just back off releases to offer us some low water sulphur hatch fishing…. Have a great one, enjoy your Memorial Day holiday honoring those who have fought for and continue to fight for liberty and freedom. We salute you all! 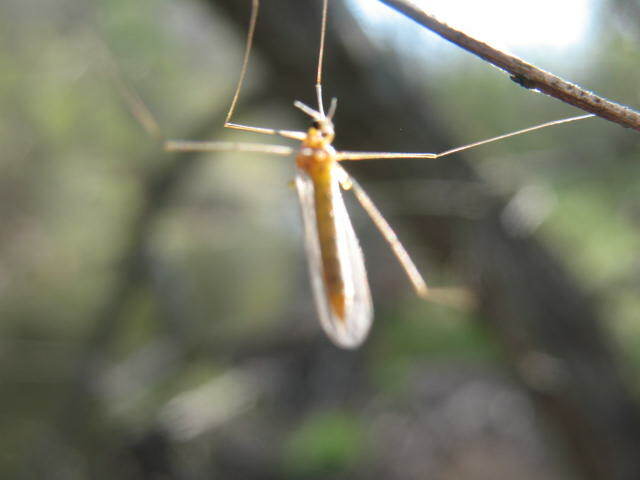 Craneflies are a tailwater staple from spring through fall…..you need a few #16 and 18 imitations in your box too if you fish tailwaters and some of our lower elevation DH waters. Our piece will appear in our next newsletter, but as readers and those who subscribe to this fishing report and our blog you will get first look at it….here’s the piece on fishing high water…just click the link and it will take you right to the article…. 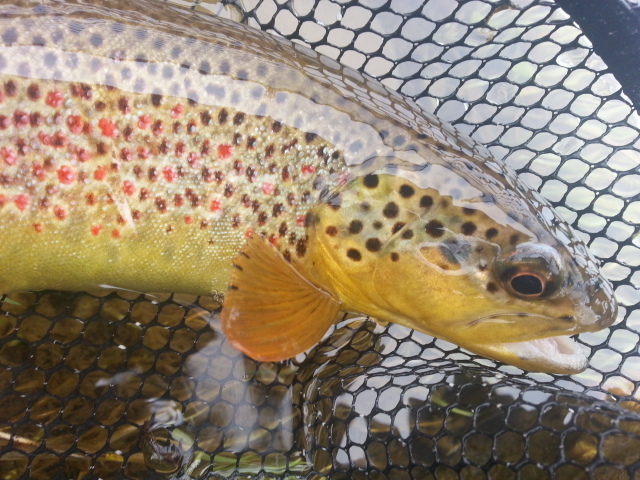 Have a great afternoon…..will have an update on conditions and fishing in the morning. Enjoy a couple of cool nights coming up! Unsettled Weather Continues, Cold Front at Our Backdoor…. Thurs. May 23, 2013…. 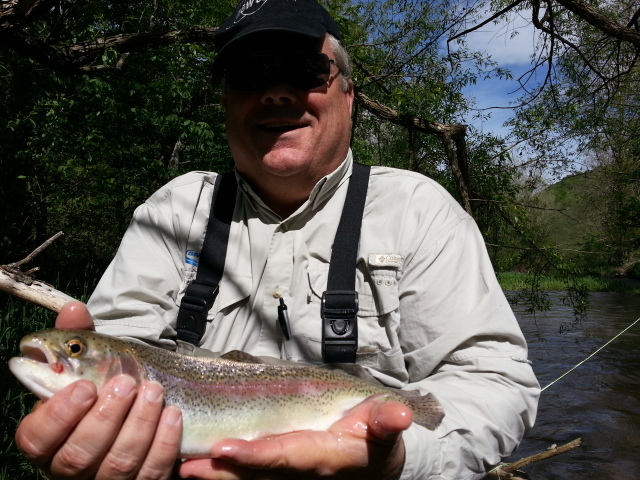 In the last 3o yrs and in my time doing this fly fishing gig I have seen a lot….experienced a lot…I must say the weather both by type and intensity have exceeded any year previous to this one. I remember another May in recent memory that things were all over the place, and that was in 2008, but nothing like this May. This one will be one to tell the grandkids about…..”….uh, I remember back in 2013…….” you know how the story goes…. Had a trip scheduled today guiding Dr. Scott and Diane Bertrand and I cancelled due to all day releases on the South Holston and high muddy conditions. I had been taking clients to smaller waters and doing very well but the last two days put a fork in that plan…Done. Well done. Cooked, our goose that is. A no go, we finally reached the point where all the places I have been guiding are high and blown out or pretty well unfishable. Here’s the “compleat” weather scoop from Rays Weather in Boone. I figure that the next two days, or at least through Sunday, may well be shot as more weather is on tap for today…. Flash flood conditions all throughout the mountains through midnight tonight. Any rain today will push already swollen streams and rivers to the edge once again. It’s been a long time since a front moved through from the west. Tonight’s the night. Expect scattered showers and thundershowers today, especially later today and this evening with the passage of a cold front out to our west. Rain chances hold on through tonight and into tomorrow morning. After that, sharply drier and cooler. Really cool. The front will move off the Southeast Coast Friday. Low pressure will stubbornly hold in New England this weekend, and cool Canadian high pressure will settle into the Tennessee Valley and Southern Appalachians. Expect an impressively cool Friday (for May) with gusty winds. We’ll have morning clouds with some early light rain or drizzle possible. In spite of the cool temperatures, sunshine will take over by afternoon. As winds diminish Friday night, valleys could see frost late Friday night. I’ve said it a thousand times, wise gardeners around here hold off until Memorial Day. The weekend will have lots of sun but dramatically cooler than normal temperatures. 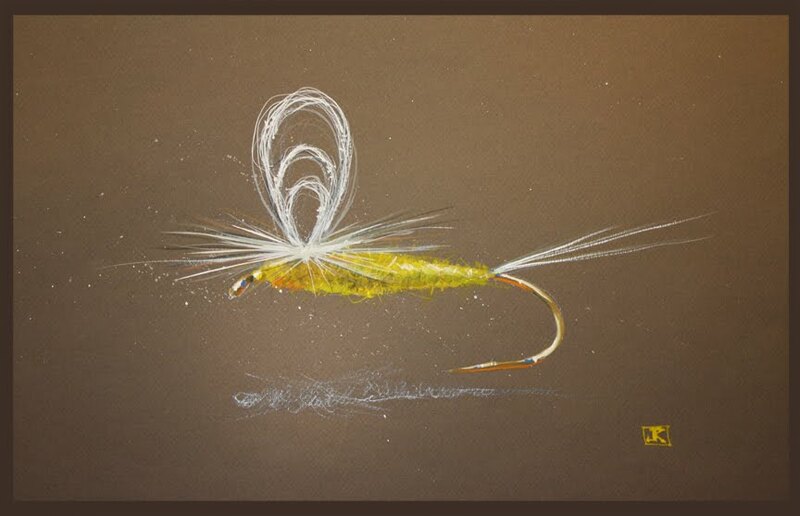 The mantra this week while fishing stained high water has been “If its brown, better get it down”…..move it, twitch, jiggle, strip ,pause……moving the fly will work wonders if the water is off color. Finding a slower pocket of water and twitching a fly through it can catch you a lot of fish when the water is up and dirty. High water pushes fish either to the bottom, the edges, or into the “soft water “(inside of bends, tailouts, eddies, undercuts)….soft water is water adjacent to the faster water, places you often stand because you can…its slow, calm, etc., trout are using these spots during high water. Not only to get out of the heaviest current and save energy, but also to feed. Yes, they do feed when conditions are bad. I am writing a blog piece on this topic today that will appear in our upcoming newsletter so stay tuned to check that out as well. 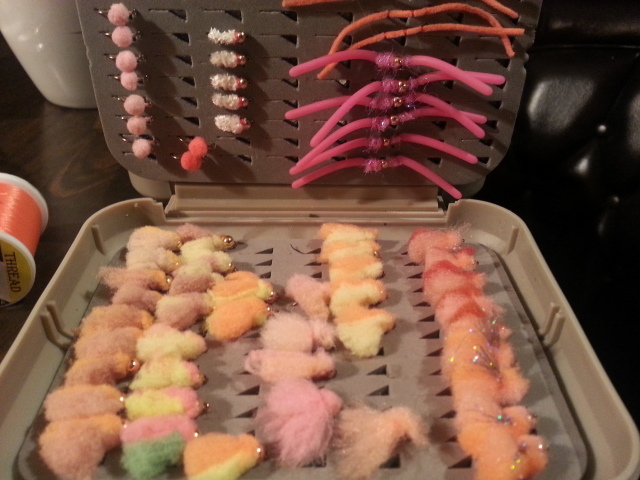 Have a great one today, I’d better get to finishing a ton of custom fly orders…. Stormy Weather Continues…..So Does Catching Fish…. Wed. May 22, 2013….Had a trip scheduled today with Jeff Chalmers of Summerfield, NC, but we rescheduled to June 27, 2013. Been very wet here, and the storms continues. Looks like a cold front moving in and some really chilly air behind it, could see frost over the weekend over some of the valleys in the mid to northern NC Mtns, SW Virginia, and East TN. We had some horrendous storms last night, and got about 4″ of rain. Just keeps coming. Here is a report I posted on our main site…. 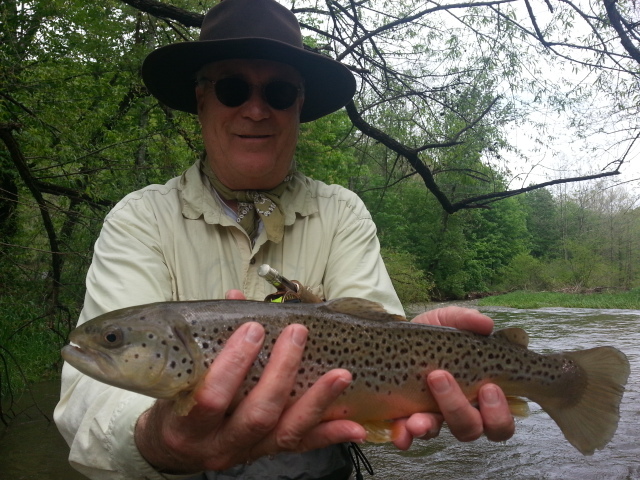 Did a trip with several of my regular clients, Dave Link, Mike McKee, and Mike Wood, Chapel Hill, NC, Durham, NC, NC Mtns, we ended up fishing two waters both of which were high and muddy…and again pulled off a good day despite the horrid conditions. Thanks to the Lord! Just proof if you know where the fish are, where they go, and how they respond to changes in conditions you can catch them. The past week is proof of that if anything. Have an opening Friday 5/24, if ever you wanted to learn a lot about high water fishing in challenging conditions and turn some of those busted trips into some opportunity now is the time…..! 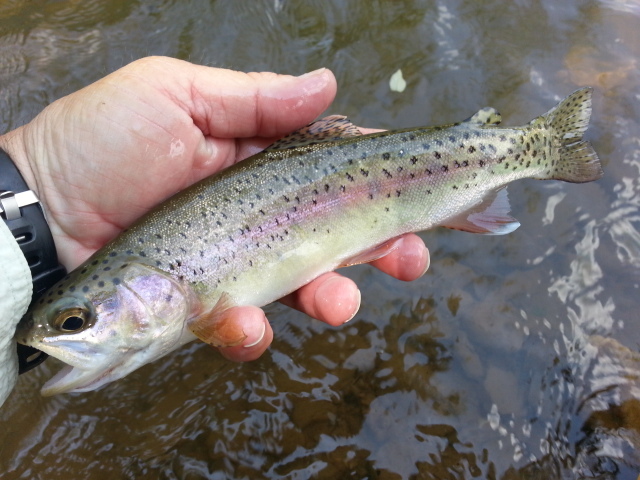 I met up with the guys near Warrensville, NC near Big Laurel and we headed off to fish, the water was high and murky to muddy and we rigged up with some of my ‘muddy water specials’ including my hot pink worm pattern that we smoked them on…for the third time out this week that fly caught the most fish and all the largest fish. We did our usual fishing soft water…banks, tailouts, foam eddies, eddies, edges….water you ‘d normally stand in. Stand in that water or those places when the conditions are like they have been and you will be standing in the fish and fishing where they aren’t. We fished dead drift, twitch /pause, twitch /strip presentations and all worked, particularly the twitching. Twitching helps the fish see the fly or ‘alerts’ them to it and can make them strike. I also on purpose use an over sized indicator or Thingmabobber because the indicator on top is a static point or pivot point where the indicator bobbing up and down over the turbulent surface in effect ‘jigs’ the fly/flies for you. Its deadly. We caught two 20 inchers , two citation fish in the first 5 casts fishing a pod of fish I know on a first name basis…lol. We landed a dozen fish from that pod. Mike Wood and Dave Link scored a 20 incher in that first stretch, Mike McKee caught numbers. But it was good, we moved down to another stretch and fished again and caught several fish….one here, two there, probably another 8 or 10 fish. We also caught some stripping streamers, a tactic that works when the water is up and murky. Water temps were in the mid to upper 50’s , lots of bugs coming off…sulphurs, yellow stones, black caddis, tons of flies but with high water no one rising to them. That’s normal. High muddy or murky water you are wasting your time fishing on top. High or murky water you are wasting your time fishing on top. High muddy or murky water you are wasting your time fishing on top. Take my word for it. We fished on through, hit another stream, had a quick BBQ lunch by the river, then headed over to another stream. The afternoon fishing was pretty good, water temps were 61F… great for fishing ….rising quickly though in the muggy 82-84F daily highs over the past few days. Coming cool weather this weekend will help that for the better. We immediately were into some more fish, hit two spots after lunch and Mike Wood landed a 25 inch rainbow, another fish on the hot pink worm pattern….not a San Juan….hint. We fished two or three more stretches before calling it a day and caught another 20 or so. 40 fish or more by my estimation, a mix of browns, brookies and rainbows with 3 fish over 20 inches, two of them rainbows and one a brook trout that was 20.5″. That is a banner day anywhere, anytime, under any conditions…let alone high and muddy conditions that would have kept a lot of folks home. Have been showing folks all month that packing it in and heading home when the river is high and murky or off color can be a missed opportunity. Sometimes you have to give up what you wanted that was good to get something else that is better. I mean if catching a lot of fish and several big fish appeals to you. 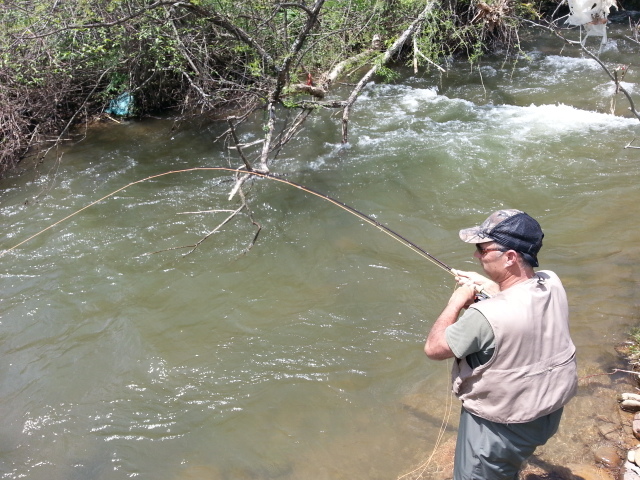 If you can do that who cares what the river looks like…..as long as you are in the fish? I mean you will never find conditions where you can get away with making more mistakes, noise, sloppy wading, bad casting , etc., all the normal ills that spook fish …..so why not take advantage of it? Well, needless to say, I made believers out of a few more folks that fishing high water in less than what looks like perfect conditions can be quite rewarding and sometimes you’ll do better than you could have if the river were ‘perfect’ like you like it. Attitude and perspective are everything. 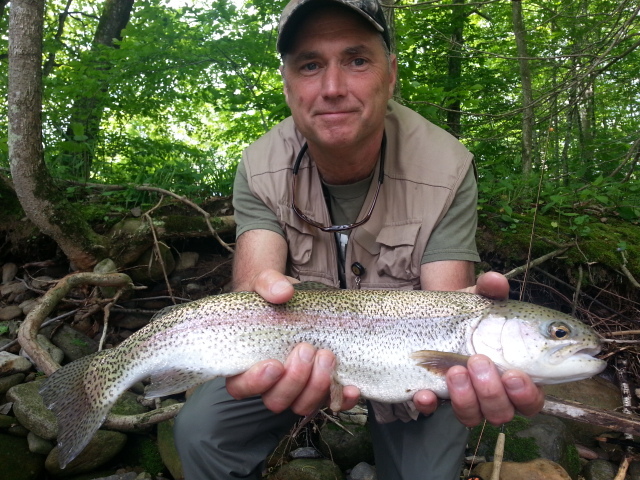 Headed home to see my bride, sons, and all the other kids (doggies)….will hopefully be out again tomorrow guiding Dr. Scott and Diane Bertrand and we’ll be on the South Holston as it appears that they are finally cutting some back on the release schedule and that will permit us to do some fishing. 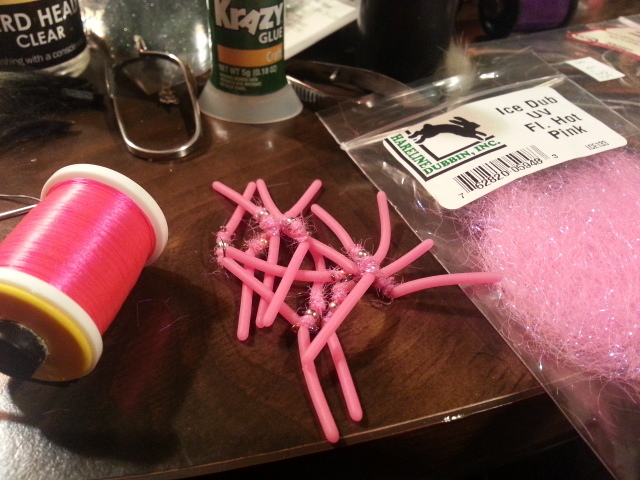 We will be sight fishing midges to cruising browns….and I can’t wait. Have a very busy guiding schedule coming up and we are right in the thick of one of our busiest seasons…..whew! 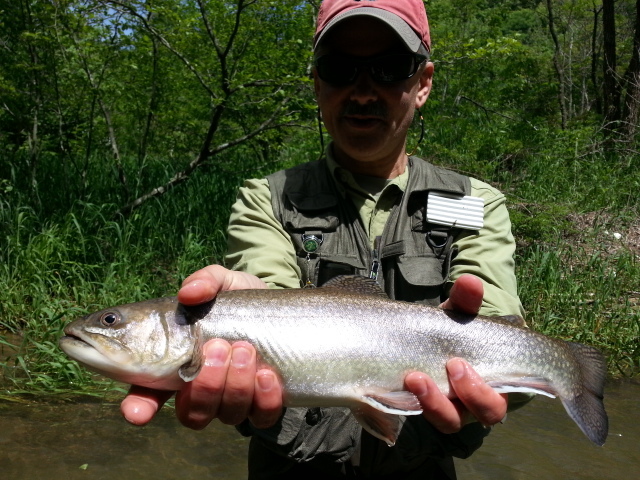 Visit Don Kirk’s Southern Trout online here ……lots of great info in the way of articles, how to’s , etc. 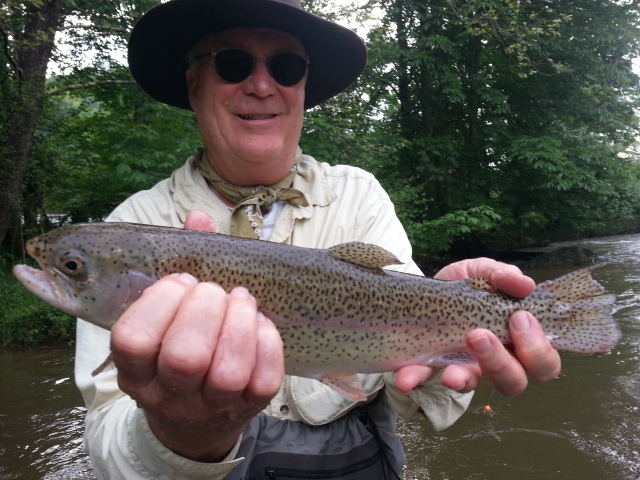 Tues. May 21, 2013….Guiding Dave Link, Mike Wood, and Mike McKee all from the Triangle area and we have done very well landing 15 to 20 fish in the first hour and a half. 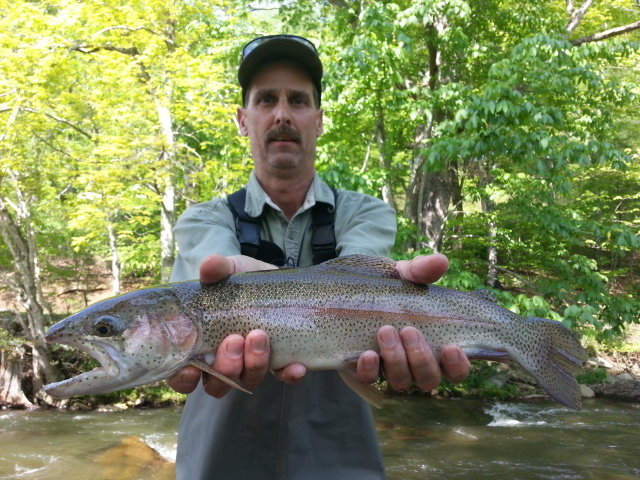 Two huge fish in the mix, a 22.5" rainbow by Dave Link and a 18.5" brook char by Mike Wood. Water is high and very off color….like fishing late runoff conditions out West. 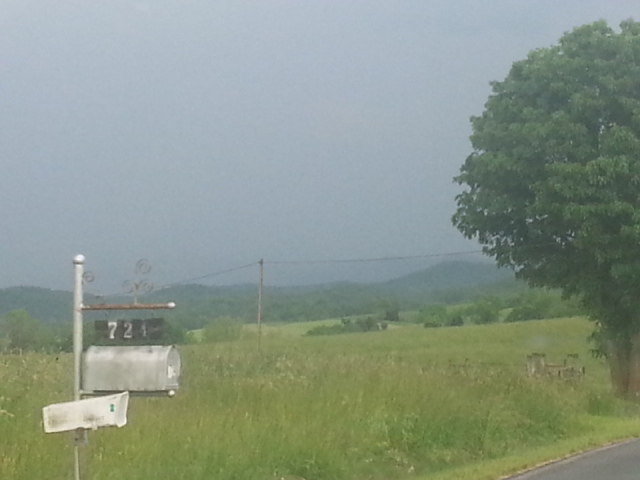 Going to be a terrific day if thunderstorms dont get us…. Tues. May 21, 2013….Such a nice morning, the sun is out and shining brightly as I get started with another day. Its the 21st…where has the month gone..? Looks like today and tomorrow the thunderstorm threat returns but hey that is normal…..its spring and the mountains. Had a phenomenal day yesterday in some very tough conditions. Guided Dr Scott Bertrand one of my favorite and regular clients… and we dont mind a challenge and welcome the opportunity to be faced with tough conditions and having to figure out a way to catch fish. The Lord gave us a great day in son3 tough conditions. It was almost unfishable but when your client is on vacation you try to go beyond the norm and make things work. That is what we did and did well scoring 35 fish and several bigs, one citation brown and one citation rainbow. Showed Scott some tricks for fishing high and dirty water and it worked like a charm. We caught all our fish nymphing and streamer fishing and I introduced Scott to the deadly technique of twitching the soft water and banks and tail outs. It simply killed them and Scott learned a trick he can use from now on. I am headed out to meet my clients for today, Dave Link and his group and it should be a great afternoon. Mon. May 20, 2013….. Had a full and busy day…today was wet and started with thunderstorms but here’s how it all panned out…from a report I posted on our main site…. Looks like all day/night generation on the SoHo, we’ll be rescheduling or fishing somewhere else…Woke up to severe thunderstorms, in fact I was up early tying flies for the day’s fishing and noticed the rumbling outside and we had about 2 hours of heavy thunderstorms….to start the day. 24 days with measurable rain in East TN. So its wet…a lot of places are high and blown out. 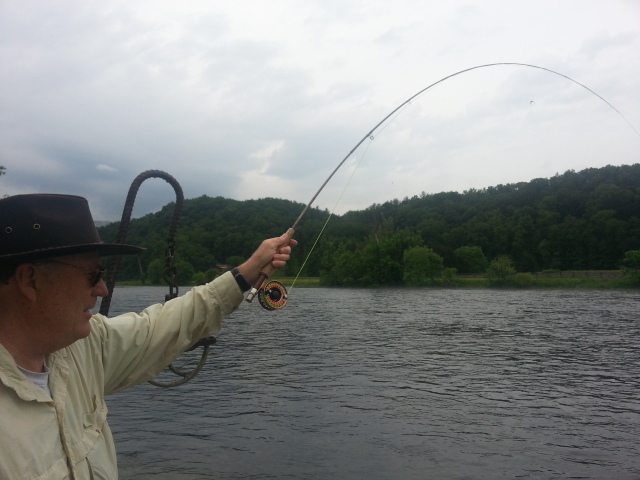 I did a casting lesson on the South Holston with Diane Bertrand to start, I rigged up Scott a rig to fish while we were doing the lesson with Diane, he landed one very nice brown trout. 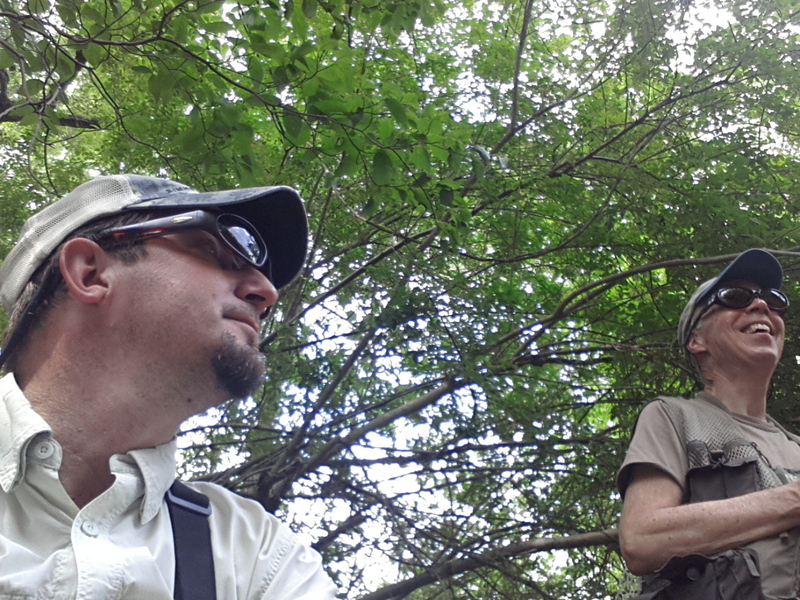 We finished the lesson, and then I headed off with Scott to guide him on a nearby NC water. Everything we drove across was high and muddy, some waters near flood stage. Today we picked the lesser of blown out waters but still fished high and muddy water. Where we ended up I assured Scott fishing has been good and that though conditions were to the outer limit of fishable and bordering on blown out, the color of the water was still workable and I still thought we could do well. It didn’t take but about 5 minutes for that all to prove true…Scott landed 8 fish the first spot and one was a 20″ brown….and we had on one other 20″ plus and it came off. 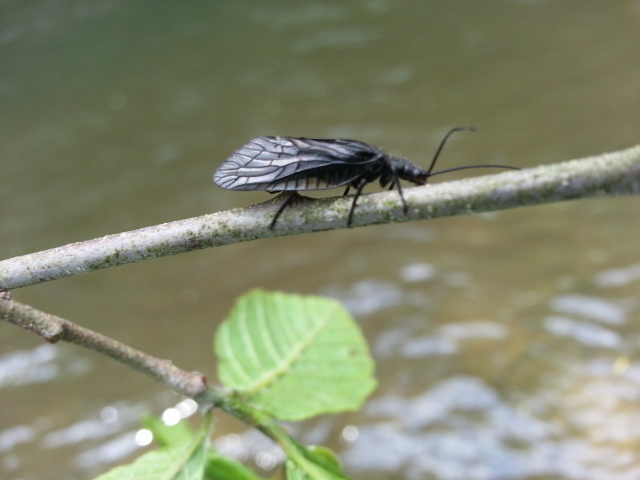 We fished three or four other spots downriver, all with heavy nymph rigs and some special “muddy” or ‘murky’ water patterns I have been working on…new flies…and they did well. We fished the soft water, banks, tailouts, all the typical high water haunts and caught fish in them all. 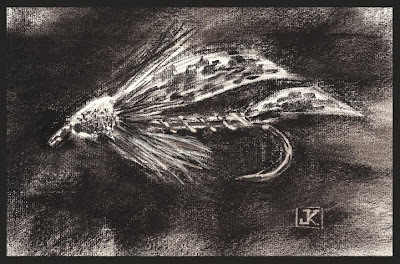 We used the moving the fly during the drift on some presentations and twitching it….techniques that work on stubborn fish or in murky to muddy conditions…it helps fish see or ‘hear’ or notice the fly. Mon. May 20, 2013….24 days straight with measurable rain….pretty incredible. But thanks to the Lord we have been in fish and fishable water despite it all. And some pretty good trips even in some incredible yuck. Another stormy start today, got up early and tied flies and it was noisy outside with all the thunder rumbles ….when is it going to end? Headed out to guide a couple of my fave and regular clients, Dr Scott Bertand and his wife Diane. We had planned on the SoHo but looks like we will be hitting a NC water instead. More to come later from the river….have a great one…!